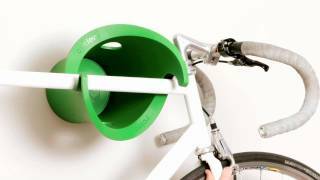 Bike storage that is practical and stylish, the Cycloc Wall Mounted Bike Holders unique shape, combined with your bikes own weight, holds it instantly in place and you can even attach a normal bike lock for security. Cycloc is strongly constructed and fits a wide range of bike frames. A matching insert panel neatly conceals the three fixings and slotted mounting holes allow Cycloc to rotate to match the angle of your frame. Each Cycloc unit includes a spacer for use with wide handlebars (not required for road bikes). Cycloc's built-in storage space is ideal for keeping lights, gloves and other cycle accessories. The Cycloc can store bikes horizontally or vertically, even folding bikes can be accommodated. Please Note, The Cycloc bike holder does not come with mounting bolts, and this is because it can be mounted to different materials eg brick, plate, wood.